The Rochester Magazine Business & Resource Directory is Out! 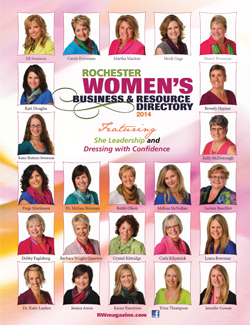 Take a look at the Rochester Women’s Business & Resource Directory! Click on the magazine cover and go to the site. You can find the print magazine for free in many places (restaurants, offices, etc.) in and around Rochester, or you can download a free PDF copy from the site. This year, the directory is focused on leadership. I have an article titled, Dress With Confidence – Impress for the Position You Want. (Page 28) Learn what colors, fabrics, prints, and accessories can increase your confidence. Yes, you can look and feel fabulous – fast!